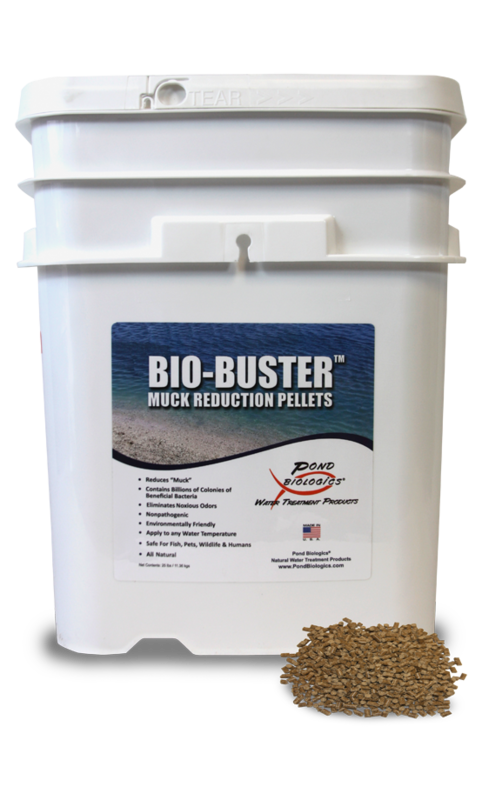 Bio-Buster™ Muck Reduction Pellets are a custom blend of beneficial enzymes and microorganisms, compressed in an easy to apply self-sinking pellet. Bio-Buster™ is designed to naturally reduce organic sediment in ponds, lakes and waste-water lagoons, while also reducing odors and improving water clarity. Bio-Buster™ pellets are self-sinking and attack organic sediment (muck) directly. Bio-Buster™ pellets assist in the digestion of leafy debris, dead aquatic vegetation, grass clippings and other organic waste/muck buildup. Bio-Buster™ is safe for use in recreational water bodies, livestock ponds and waste-water lagoons. Bio-Buster™ is Environmentally friendly and has no water use restrictions. Safe for humans, pets, fish, wildlife and livestock. Apply 1 pound of Bio-Buster™ Muck Reduction Pellets per 4,000 square feet of treatment area, once per month. Apply pellets evenly and directly to the target area where muck reduction is desired. Apply 10 pounds of Bio-Buster™ Muck Reduction Pellets per 1 surface acre of treatment area. Broadcast evenly throughout or over the entire treatment area. Apply Bio-Buster Pellets Once Per month.